Sam’s testimony to Steven Spielberg’s Survivors of the Shoah Visual History Foundation, which he gave on April 13, 1997. Surely it is a miracle that Sam Solasz is alive today. He could have turned out to be another grim statistic, counted among the six million Jews who perished during the Holocaust. It is a tribute to his amazing resourcefulness and love of life that he walks the earth while countless others lie buried in unmarked graves. seven sons and four daughters, Mr. Solasz’s parents were devoted to one another, and observed the traditions of their Jewish faith. Solasz remembers that as a young boy, he accompanied his father every day into the city of Bialystok to do business there. This is how the lad developed a love for it, as well as a cartographer’s knowledge of each street and alley. To this day he often reminisces about his joyous experience as a youngster walking through the “Big City, ” alive and bustling, creative and prolific — only to be jolted by the knowledge that the citadel of his youth with which he once had a love affair exists no more. In 1939, during Solasz’s eleventh year, Bialystok became a pawn, moving back and forth between Russian and Nazi hegemony. Under the Russian occupation. Solasz moved from Knyszin to Bialystok. When the Nazi invaders constructed the infamous ghetto in Bialystok in 1941, he returned to Knyszin. Life was fast becoming precarious for every Jew, the Solasz family included. Mr. Solasz often thinks back to November 2, 1942,a day when twenty towns officially surrendered to the Gerrmans. Most of the Jewish inhabitants of these hamlets were rounded up: whole families were separated and placed into trucks carrying them into the cattle cars that would transport them without knowing where on their final destination to Treblinka, the efficient Nazi death factory sixty miles from Bialystok. Inevitably, sleds pulled up to the Solasz home in Knyszin, herding all of its residents to a transit camp in Bialystok, the port of embarkation for Treblinka. sight. In this way he was able for ten months to slip undetected in and out of the Bialystok ghetto, smuggling food inside for the slowly starving prisoners. Outside the ghetto, he posed as a Polish youth. To make this disguise convincing, he wore a cross around his neck. Although hovering between life and death,xhe was able to fool the Nazis. Mr. Solasz likes to tell how he once saved a Jewish man from certain death. This man, Paul Chorowski from Zabludowa, lived in the Bialystok ghetto. During the day, the Nazis forced him to perform work outside the ghetto near the highway. Whenever Chorowski returned, he would sneak a bit of food inside. One day, when he went to a nearby village to obtain some food, a Polish peasant went to Solasz’s father with the story that peasants had murdered Chorowski. went off in the wrong direction, following my instructions. Their search, of course, was futile, because Paul Chorowski was already back inside the ghetto.” Paul Chorowski was deported from the ghetto to various concentration camps, where he suffered horribly. Nevertheless, he survived the Holocaust. After the war he came to the United States and raised a fine family. Today he lives in Long Island City, New York. 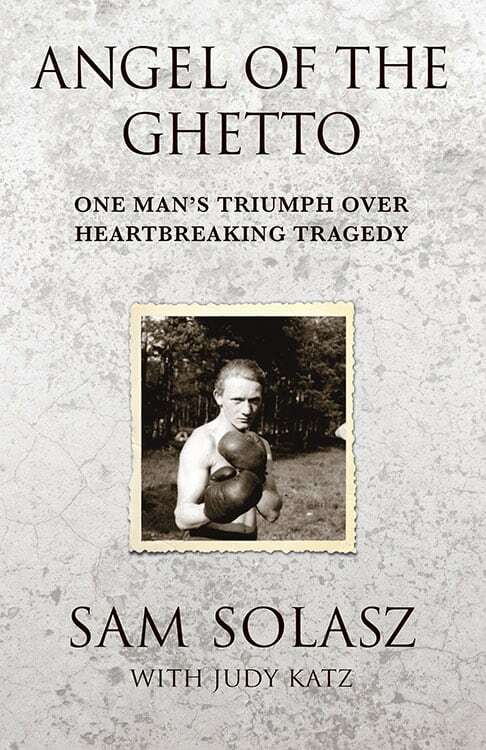 The Bialystok ghetto was liquidated in August 1943 and Sam Solasz was finally caught and given a one-way ticket to Treblinka. Once again, knowing that he had to escape, he plunged from the railroad car in motion, rolling toward the surrounding forest where he found refuge. He left behind his parents and many of his siblings, who ultimately suffered extermination. For the next year he fought with the Russian partisan forces, which conducted guerrilla warfare against the Nazis. On July 1, 1944, he and the others were liberated by the Russian Army and allowed to return to Bialystok. There he had to rub his eyes to make sure that what he was seeing was in fact true. The city was reduced to rubble, all of its houses and institutions razed to the ground. Everything familiar to him had gone up in smoke. The foul stench of destruction pervaded his consciousness. The next years Mr. Solasz spent in displaced persons camps in Germany, gradually attempting to rebuild his shattered life. He acquired experience in meat handling, formed new relationships and renewed old ones. Later survivors in the DP camps talked about emigrating to Israel, where the establishment of a Jewish State was in the works. In 1948 Solasz joined the Aliyah Bet, people wishing to settle in Israel, later voluntering for combat duty in the Israeli armed forces during the War of Independence. Assisted by the Government, he went into business and discovered that his father had some relatives in the United States. With the aid of HIAS, he arrived in New York in January 1951. Finding a job in the third largest meat corporation,he developed an intimate knowledge of the meat processing and packing industry and, in September 1957, founded Master Purveyors, Old Bohemian, Temple Beef and S & S Meat companies. These firms provide meat to the largest hotels, restaurants and institutions in the United States and abroad. As a result of his sharp mind, his retentive memory and his ambitious drive, Sam Solasz has become a prosperous entrepreneur. Yet business is not Mr. Solasz’s only interest. An extremely charitable and hard-working individual for Jewish communal causes, he serves as the President of the Bialystoker Center and Home for the Aged. Before that he held several other important leadership positions within this institution. Mr. Solasz married Rose Cohen on June 29, 1957. Her parents, Sephardic Jews, were born in Salonika, Greece. Mrs. Solasz was born and raised in New York along with two brothers. Sam and Rose Solasz have three children, Diane, Scott and Mark. Sam Solasz’s saga restores confidence in the human capacity to overcome extreme adversity Moreover, his pride in his origins, his zest for living and helping others are a fitting tribute to his beloved Bialystok, whose legacy he has scrupulously fulfilled.